Heat oven to 200. Start your grill per instructions on BBQ or grill . Take your thawed Tofurky and cut off one end about 2 inches from the pucker. When you look at your Tofurky, one end is more open than the othe; you'll see a bit of stuffing on that end. That's the end you cut off. With a normal spoon, begin removing the stuffing from the Tofurky. You're going to be hollowing out the Tofurky, so watch the sides to make sure you don't get too much of the Tofurky; you only want to remove the stuffing. Also, be careful you don't hold your Tofurky too hard and "crack" the side. Take your time and be kinda gentle with it. You'll notice that the empty tube in the center is not straight. Don't try to straighten it out by removing any Tofurky. Once you have removed all the stuffing, grab your can of Beer. Gently place the open hollowed-out end of the Tofurky on the top of the Beer can. You're looking to see how close your Tofurky is to fitting. Very gently, press the Tofurky down to make a slight ring on the open end of the Torfurky. This will be your guide to how much you'll need to remove to make the Tofurky fit on the top of the Beer Can. With a small very sharp knife, follow the indent from the can, and make the opening of the Tofurky a tiny bit larger - around the same shape as the Beer can top. You want to make this opening 1 1/2 inches deep into the Tofurky. Cut a very little at time, and test the Tofurky on the top of the Beer Can between each cut to see if you have cut enough away. Place the Tofurky in the oven, hollowed out end down, for 5 minutes. This will help solidify the Tofurky. In a bowl, mix the ingredients for the Beer Can Rub with a whisk to make sure there are no clumps. Remove the Tofurky from the oven and let sit. Once it is cool enough to touch, bush the Tofurky with the Beer Can Rub, inside and outside. Beer Can Tofurky ready to be grilled. We went with Simpler Times Pilsner for our Beer. OK, not ideal - but it still tasted amazing. So if this happens, don't worry, just keep going and enjoy! Hopefully, yours won't do that if you're gentle with it. 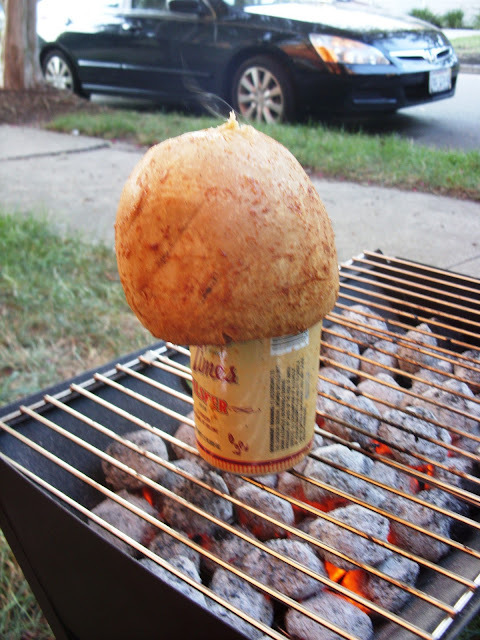 Place your Tofurky with the Beer can in it gently it on the grill upright, so the bottom of the can is directly on the grill. See the photos above. 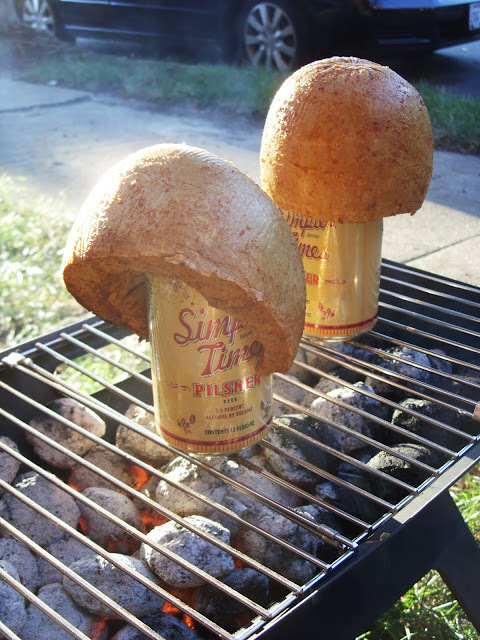 While the Tofurky and Beer can are on the grill, periodically baste the Tofurky with the Beer Can Rub. Brush a little coating of the Beer Can Rub on your Tofurky to keep it moist and add flavor. Be very careful while you're doing this, to keep the Tofurky and Beer can from tipping over. The hole in Tofurkys isn't usually centered, so one side may be heavier than another. You really need to balance this just right and keep an eye on it to keep it from falling over. We suggest using a pair of BBQ tongs to hold the can while you baste for stability. OK, not our best photo, but you can see the steam and that's what matters. Once you have steam coming out of the top, and the outside of your Tofurky is the desired golden brown, use your BBQ tongs to remove the Tofurky from the grill. This should take around 30-45 minutes depending on how hot your grill is. 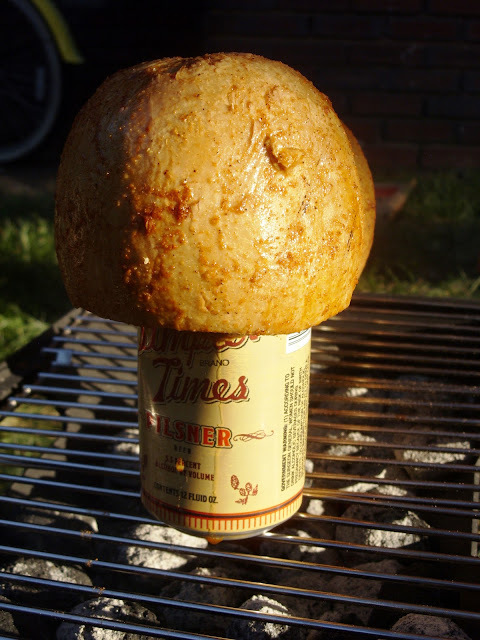 When you move the Beer Can Tofurky, be careful to not spill the Beer inside the Tofurky. 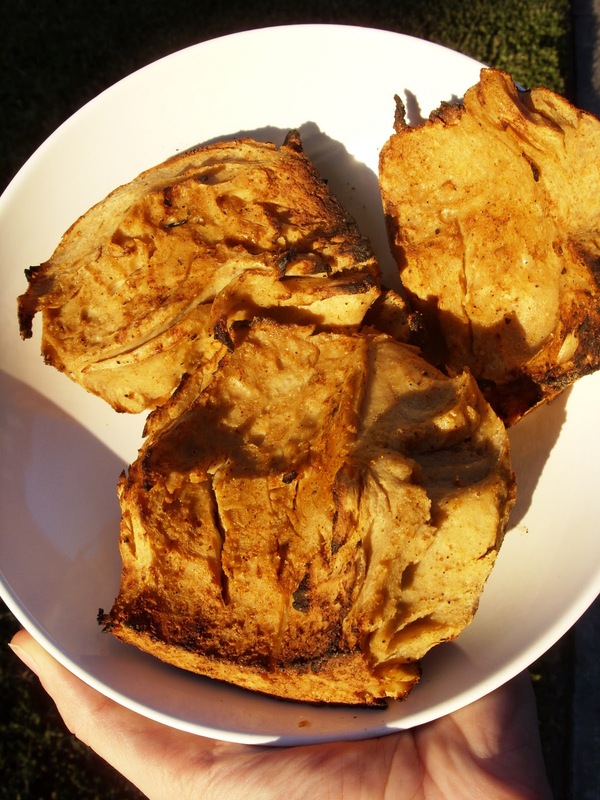 The can and Tofurky are hot, so don't touch them with your bare hands. 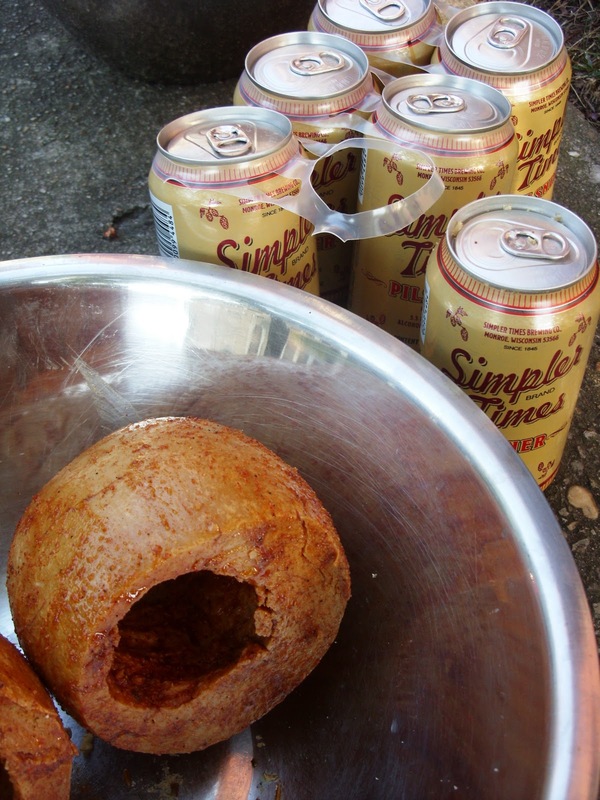 While keeping your Beer can upright with your tongs, use your oven mitt to sort of pop the Tofurky off into a large bowl. To serve, cut into chunks and maybe dip in your favorite BBQ sauce. But to honest, we loved it as-is. It had flavor and a unique smokiness to it. It also had a great texture, and really made something we've eaten a million times (Tofurky) into something completely new and different. I highly recommend trying it out this weekend. I think next time we may try it with some Match Vegan Meats Chicken. 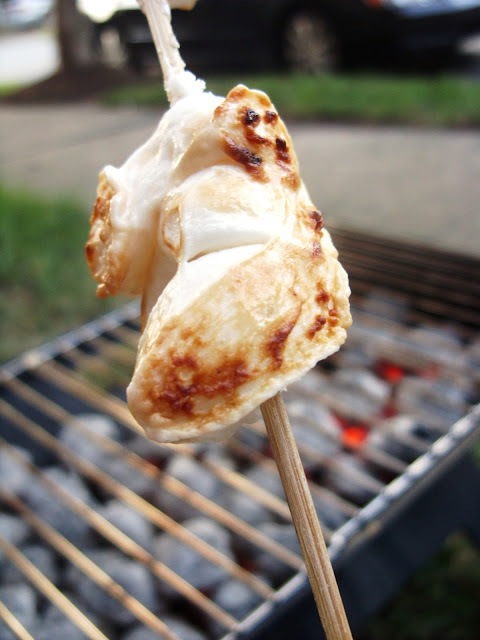 We ended the night chatting by the grill and before Dan went in for his fantasy football draft, I roasted some of the leftover marshmallows from the Mexican Hot Chocolate cupcakes and pretty much ended my summer on a high note. Wow, I guess I've led a sheltered life (or maybe it was growing up in California), but I've never heard of beer can chicken. Looks interesting though. I may have to try it. Hahahahaha, before going Vegan we have made beer-can chicken.. they even make it on the Food Network... this is a great idea! I never heard of Beer Can Chicken either but I can't wait to try this, talk about yummy! you really are a genius!!!!! This is like.. WHOA! whoooooa. They have special beer-can holders to make beer can chicken that help stabilize everything. You should look into getting one. I love mine! Dude. This may be the best blog post I've seen on any blog this year! I don't own a grill, but this sounds soooo right up my alley. So I'm most definitely going to try this at my parents house using their grill...maybe even for Thanksgiving! I've never seen this method- sounds amazing!